Helaman 11–13 covers 14 years of Nephite history in which the people passed through a repeated cycle of righteousness and wickedness. Because of their pride, the people refused to repent of their wickedness. Nephi sealed the heavens, causing a drought and famine. The drought and famine humbled the people, and they repented and turned to the Lord. Because they did not choose to be humble, the people began to easily forget the Lord their God until they were brought to a realization of how much they needed His help. This history shows how quickly people can forget the Lord and how He chastens them to help them repent and return to Him. In His mercy, God chastens His people to bring them unto repentance and salvation. Each of the diagrams above is a little bit different, but I like each one because each diagram has a special perspective on what Latter-day Saints have come to identify as the Pride Cycle. If we are honest with ourselves, we can probably identify many times in our lives when we have fallen victim to the Pride Cycle. By examining the diagrams closely we can also learn how to avoid repeat rides on the Pride Cycle, and instead enjoy the blessings of the Prosperity Cycle. When we do not follow the words of the prophets we usually end up taking a ride on the Pride Cycle. One of the many ways in which the Lord’s prophets profit us is by providing preaching that prepares us to prosper. I have included an article below that shows what the prophets Nephi, Lehi, and Samuel the Lamanite did during this specific time period to try and help the people to be prepared and prosperous, rather than prideful and perilous. Because “the record of the Nephite history just prior to the Savior’s visit [Helaman] reveals many parallels to our own day as we anticipate the Savior’s second coming” (Ezra Taft Benson, Ensign, May 1987, 4), we would do well to consider how our modern-day prophets are trying to help us to avoid the perils of the Pride Cycle like Nephi, Lehi, and Samuel all tried anciently. They tried to prepare their people for the Lord’s coming. Most of us are incurably romantic in our attitudes toward life. We like to mentally entertain happy endings, lucky breaks, effortless successes, and sudden character transformations. Some among us even seem to regard salvation as a matter of good fortune and hope God will be particularly merciful on that great and final judgment day. Yet, over and over, the scriptures demonstrate that life is not a romantic fairy tale, but a law-abiding and largely predictable reality. Mercy is not something to be bestowed upon us gratuitously at the day of judgment, but something that has already been offered through the atonement of Christ, and we are able to receive that mercy only upon conditions of repentance and obedience. The book of Helaman vigorously illustrates this same teaching: that man must use his agency to choose the way of salvation according to the conditions upon which mercy is based; otherwise, he will forfeit the proffered blessings according to the laws and judgments of a just God. 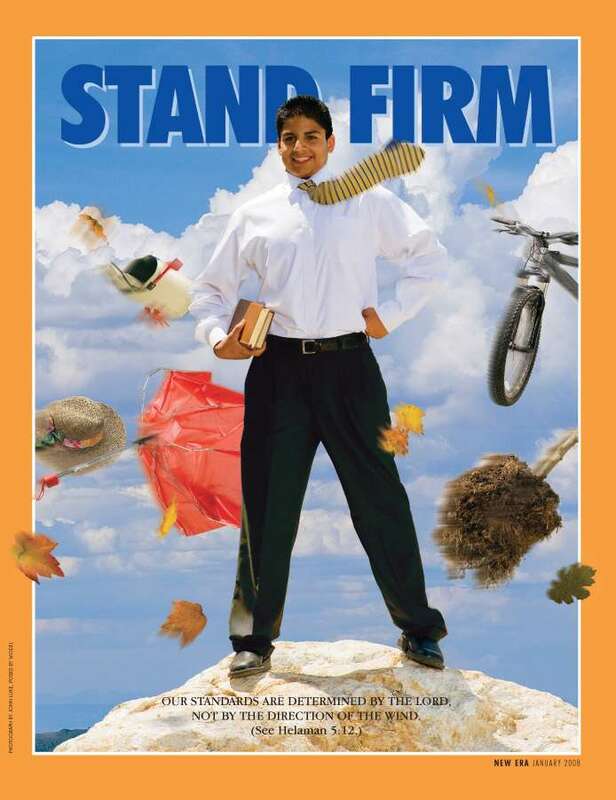 As Nephi and Lehi, the sons of Helaman, pursue the duties of their ministry, and as Samuel the Lamanite joins with them later in their largely futile efforts to prepare a rebellious people to accept the coming Christ, we see that even God is unable to reclaim those who refuse to accept the conditions that would allow them a place in the merciful plan of redemption. But if the teetering of man between the claims of justice and the claims of mercy were all the scriptures offered for our edification, the reading might have very little human appeal. It is often difficult to get excited about abstract principles, even when they affect our eternal destiny. Fortunately, the Book of Mormon, like all the scriptures, has another dimension that makes it possible for us to share feelingly in the conflict. When we read the book of Helaman, for instance, we do not just read of the conflict of good and evil; we read of people involved in that conflict, people who feel strongly about what is happening to themselves and to others. Nephi, the son of Helaman, through whose eyes (though at times with Mormon’s editorial comment) we see most of the events, is not just a recorder, not a computerized robot collecting and storing up evidence for and against the children of men; he is a dedicated and caring human being. When we read his words or those which he quotes from the teachings of Samuel the Lamanite, we are permitted to share in more than just historical or doctrinal observations and judgments; through these words we also experience the proper and powerful feelings of a servant of God and come to know more fully how it feels to be righteous and obedient. Through sharing vicariously the aspirations and disappointments, the joys and sorrows of Nephi or Samuel, we discover more fully the love of virtue which we ourselves possess and come to recognize more expertly and cherish more earnestly the behavior and feelings which constitute that virtue. In order to relate more completely to the problems of Nephi, Lehi, and Samuel as recorded in the book of Helaman, let us become familiar with the historical setting of the book. It begins about 52 b.c. with a brief summary of the events that precede Helaman’s becoming chief judge over the Nephites and introduces us to the newly organized band of robbers begun by the assassin Kishkumen and continued after his death by Gadianton. In a parenthetical note, Mormon tells us that as we read on through the Book of Mormon we will see that this band of robbers finally causes the entire destruction of the Nephite nation. (Hel. 2:12–14.) But in Helaman’s day the band is small, only a minor threat to political stability. At the death of Helaman, about 39 b.c., Nephi, his eldest son, becomes the chief judge. (Hel. 3:37.) Nine years later, recognizing the inability of law to govern an overwhelmingly lawless society, and realizing also his inability to be fully effective as both judge and prophet, Nephi yields up the judgment seat to Cezoram and with his brother, Lehi, begins an untiring thirty-year ministry to try to convert his people from their sinful ways. (Hel. 5:1–4.) The difficulty of their task is overwhelming—much like trying to eliminate crime, governmental corruption, immorality, and unbelief from a modern nation. 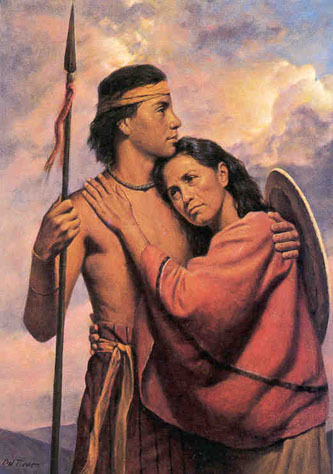 In fact, the Nephite nation was very much like those we are familiar with. Its representative form of government depended for its stability on its laws and on the integrity of its citizens and public officials. (Hel. 5:2.) 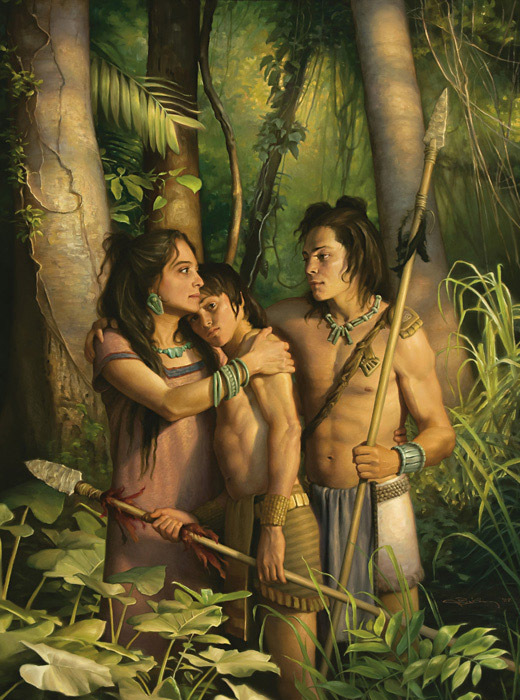 Moreover, the Nephites were in a time of great prosperity and, except for a few minor conflicts, were enjoying peace following a devastating war that had occurred about twenty years earlier. (See Alma 48–62.) Crime, in the form of the Gadianton robbers, was making rapid advances, even among members of the church. And finally, because of their wealth and prosperity, the people were becoming increasingly proud, worldly, rebellious, and contemptuous of the poor and the humble believers in Christ. Add to these circumstances the fact that prophets were foretelling the imminent coming of Christ—within about forty years, as it turned out—and we see how similar their day was to our own. “We know that this is a wicked tradition, which has been handed down unto us by our fathers, to cause us that we should believe in some great and marvelous thing which should come to pass, but not among us, but in a land which is far distant, a land which we know not; therefore they can keep us in ignorance, for we cannot witness with our own eyes that they are true. This is not the speech of persons who admit they have abandoned religion and are rebelling willfully against God. It seems very likely that the great wickedness of these people was not very different from what the world today accepts as normal. And in that world, where the pursuit of wealth, power, and pleasure is the norm and where religion is mostly a formal ritual, it is usually the true prophet, not the sinner, who is made to appear abnormal. Therefore, Nephi, Lehi, and Samuel were neither popular nor very successful in the long run in their efforts to save their society, although the power of the miracles that attended their ministry did result temporarily in great conversions among both the Nephites and the Lamanites. 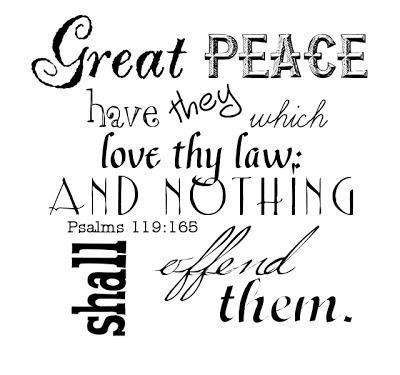 Notice that Samuel did not tell them they had offended God and were about to be cut off from his love; rather, he told them that their behavior was contrary to the nature of happiness and righteousness, or that they had gone contrary to eternal law and were separating themselves from that which is the nature of God. “Remember, remember, my brethren, that whosoever perisheth, perisheth unto himself; and whosoever doeth iniquity, doeth it unto himself; for behold, ye are free; ye are permitted to act for yourselves; for behold, God hath given unto you a knowledge and he hath made you free. In Samuel’s pleading tone, we see again that the power of the book of Helaman lies in its concern for real human souls, not just in its concern with abstract principles of good and evil. 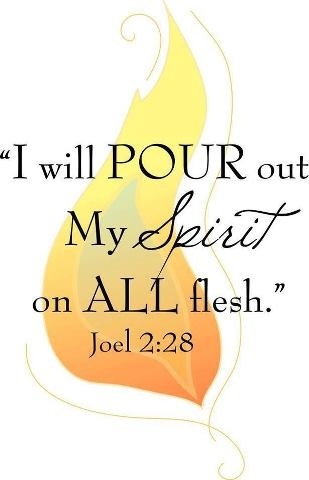 We see it unfolding through the eyes, minds, and hearts of righteous men who, fired by the vision and power of God, are doing all they can to avert catastrophe and are being frustrated every step of the way by the very persons they are laboring so diligently to save. The pain of the irony alone is at times almost overwhelming. The portion of Samuel’s prophecies contained in Helaman 15 is a sobering warning to those who have been called the people of God. Samuel reminds the Nephites that they “have been a chosen people of the Lord” (Hel. 15:3) in contrast to the Lamanites, whom the Lord has not favored “because their deeds have been evil continually … because of the iniquity of the tradition of their fathers” (Hel. 15:4). The Nephites have no cause for pride, however, because the Lamanites are steadfast and firm “when they are once enlightened” (Hel. 15:10), and Samuel declares that “it shall be better for them than for you except ye repent” (Hel. 15:14). Thus, through Nephi’s quotations from the preaching of Samuel, we are able to perceive the tenacity and depth of devotion and feeling of that great prophet; but our insight into his personality is necessarily limited because we are seeing him through the eyes of another. Nephi himself remains central throughout the book of Helaman; it is his personality that dominates. If we are to share the feelings of a prophet, if we are to taste personally the joy of seemingly great missionary successes and then the pain of watching all those successes disintegrate as a society plummets toward destruction, we must do so through him. When the account of this Nephi begins, we learn of the riches and pride within the church and the wickedness of the people generally—and we learn of Nephi’s choice to yield up the judgment seat and turn to preaching, since he had become “weary” because of the iniquity of the people. (Hel. 5:4.) We at once can see the human element in Nephi’s choice: we see that his turning to full-time preaching is not only the right or reasonable thing to do, it is the thing he must do because of his feelings about extremely distressing circumstances. The record then tells us more about this man whose emotions are involved in his decisions. He and his brother recall the words of Helaman, their father. We notice that these words are urgent and tender. Over and over we hear a loving, dedicated parent entreating: “My sons … my sons … my sons” (see Hel. 5:6–8); “O remember, remember, my sons” (Hel. 5:9); “and now, my sons, remember, remember that it is upon the rock of our Redeemer, who is Christ, the Son of God, that ye must build your foundation” (Hel. 5:12). Is it surprising that sons of such a father would also feel deeply and urgently the need to preach repentance to a society falling into unbelief? Who can read of this experience, allowing his mind’s eye to picture it, without feeling more deeply about the reality of God, about Nephi and Lehi, and about the significance of his own life. Vicariously, we experience something of what Nephi and Lehi experienced. We participate in a real-life drama with living prophets, and like them we are amazed, overjoyed, exalted in our feelings. In brief, we learn more than just doctrine. “Yea, if my days could have been in those days, then would my soul have had joy in the righteousness of my brethren. Recall that Nephi uttered this lament upon a tower in his garden, pouring out his soul to the Lord in his agony. People passing by happened to overhear him and marveled at the depth of his mourning. Hurriedly, a multitude gathered to discover the cause of such great grief. (See Hel. 7:10–11.) Read Nephi’s words (see Hel. 7:13–29) as he chides these people for their unbelief and wickedness. The words are not just “doctrine” to be learned by chapter and verse; they are the passionate overflowing of a man’s sorrow, and they range from desperate pleading (“O repent ye, repent ye! Why will ye die?”) to amazement and exasperation (“O, how could you have forgotten your God in the very day that he has delivered you?”). Picture Nephi’s frustration as he tried to convince the people that he was indeed the Lord’s messenger by prophesying the murder of the chief judge (Hel. 8:27–28), only to find himself accused of being an accomplice and cast into prison (Hel. 9:16–20). Picture then the results of his second prophecy regarding the man who had committed the murder. (See Hel. 9:25–36.) When the prophecy turned out to be true, Nephi was hailed as a great prophet; some even called him a god. (Hel. 9:40–41.) But in their controversy over exactly what Nephi was, the people became angry with one another, divided into disputing parties, and went their ways, “leaving Nephi alone, as he was standing in the midst of them.” (Hel. 10:1.) Left alone, isolated from his fellow beings, Nephi perhaps felt very lonely and discouraged. “Because thou hast done this with such unwearyingness, behold, I will bless thee forever; and I will make thee mighty in word and in deed, in faith and in works; yea, even that all things shall be done unto thee according to thy word, for thou shalt not ask that which is contrary to my will. One is reminded of the Prophet Joseph Smith’s comment: “When the Lord has thoroughly proved him, and finds that the man is determined to serve Him at all hazards, then the man will find his calling and his election made sure.” (Teachings of the Prophet Joseph Smith, p. 150.) And then, obedient to the Lord’s command, Nephi turned around, without even returning to his home, and began again to preach repentance to the people. “O Lord, thou didst hearken unto my words when I said, Let there be a famine, that the pestilence of the sword might cease; and I know that thou wilt, even at this time, hearken unto my words, for thou saidst that: If this people repent I will spare them. “Yea, O Lord, and thou seest that they have repented, because of the famine and the pestilence and destruction which has come unto them. “And behold, if the Lord shall say unto a man—Because of thine iniquities, thou shalt be accursed forever, it shall be done. “And if the Lord shall say [unto a man]—Because of thine iniquities thou shalt be cut off from my presence—he will cause that it shall be so. “And wo unto him to whom he shall say this, for it shall be unto him that will do iniquity, and he cannot be saved; therefore, for this cause, that men might be saved, hath repentance been declared. It is sobering that the narrative of Nephi’s loving and untiring service in behalf of his people must end with this passage reaffirming the immutability of God’s laws and man’s inability to be saved except through obedience to those laws. Nephi’s mission ended sometime during the year before Christ’s birth. After “giving charge unto his son Nephi, who was his eldest son, concerning the plates, … he departed out of the land, and whither he went, no man knoweth.” (3 Ne. 1:2–3.) Like Moses, this special servant of God seems to have been taken by the Lord for special purposes. It would be difficult to find in all of scripture a more devoted and powerful prophet than Nephi, the son of Helaman. As we read his account of his own labors, as well as the labors of Lehi and Samuel the Lamanite, our hearts are touched by the intensely human concern of these prophets for the people to whom they are sent to minister. Yet, with all their humanity, they stand as unfaltering witnesses of the irrevocability of eternal law—not only of the just law that judges and condemns the unrepentant, but of the law of mercy by which glory enters and transforms the lives of all those who choose to obey the commandments of God. 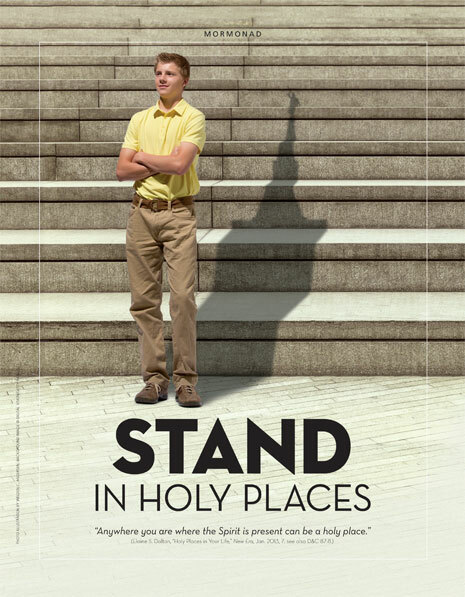 The Youth Theme from 2013, “Stand Ye In Holy Places, and Be Not Moved” (D&C 87:8), seemed to be illustrated very well in these chapters of the Book of Mormon. 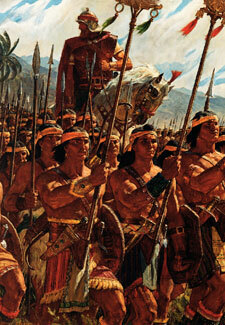 After Helaman died, the pride and contention among the Nephites caused many Nephites to join the Lamanites. The majority of the Nephites became wicked. Nephi and Lehi, the sons of Helaman, devoted themselves to preaching the word of God. Their father, Helaman, the son of Helaman, had taught them to remember their Redeemer and to make Him the foundation of their lives (Helaman 5:12). After teaching the Nephites, Nephi and Lehi went to preach among the Lamanites. The Lamanites cast them into prison. The Lord miraculously delivered Nephi and Lehi, and as a result the majority of the Lamanites repented of their sins and converted to the gospel. “When you look in the dictionary for the most important word, do you know what it is? It could be remember. Because all of you have made covenants—you know what to do and you know how to do it—our greatest need is to remember” (“Circles of Exaltation” [address to Church Educational System religious educators, June 28, 1968], 5). In Helaman 5, we see some very important things that we are to “remember”. Verse 12 is the final and perhaps the best recognized “remember” statement of the chapter. “We, too, are faced with powerful, destructive forces unleashed by the adversary. Waves of sin, wickedness, immorality, degradation, tyranny, deceitfulness, conspiracy, and dishonesty threaten all of us. They come with great power and speed and will destroy us if we are not watchful. But a warning is sounded for us. It behooves us to be alert and to listen and flee from the evil for our eternal lives. Without help we cannot stand against it. We must flee to high ground or cling fast to that which can keep us from being swept away. That to which we must cling for safety is the gospel of Jesus Christ. It is our protection from whatever force the evil one can muster. (“Hold Fast to the Iron Rod,” Ensign, Nov. 1978). It is pretty much impossible to fall off of a rock that is “broad as eternity”. I guess that is another good reason as to why the “wise man” did not get washed away in Matthew 7:24-27! Standing in holy places and being not moved is part of building on the “rock of our Redeemer”. “That strength, brothers and sisters, undergirds our position on every question of doctrine, history, or Church practice that can and often does arise as the work unfolds. You have heard those questions. They are not new. They first arose in the neighborhood of Palmyra when the 14-year-old Joseph first reported his heavenly vision, and they continue in one form or another to the present day. We have recently addressed a dozen or so of these issues in a series of essays, desiring to be both accurate and transparent within the framework of faith. Not all gospel questions have answers—yet—but they will come. Interestingly, the account of Nephi and Lehi being freed from the Lamanite prison follows these memorable “remembers” at the beginning of Helaman 5. As you think of their experience, consider how they were able to stand in holy places and build on the rock of our Redeemer even as they stood in the Lamanite prison. Their experience brings a whole new dimension to the thoughts that I have previously shared. I hope you will take some time to ponder their deliverance and consider how these principles are illustrated. You and I may will face similar challenges, but we will also be delivered as we build upon the rock of our Redeemer by standing in holy places, and being not moved!